“And here’s your gift,” my boss said, setting a large shaker of salt on my desk. He’d just returned from a trip to San Francisco. Co-workers who’d received t-shirts and coffee mugs were trying hard not to crack up, stupid grins plastered on their faces as if painted there. He looked like I’d just smacked his hand and sent him to the corner. Apparently a shaker of salt was a lot more important to him than it was to me. He let out a big Uh. “Because you love salt so much!” he said, incredulous that I wasn’t more grateful. “Oh!” I smiled, picking the glass container up and holding it with both hands as if it were the most precious diamond I’d ever received. “Thank you so much!” I deserved an Oscar for that performance. I sat the gift on my desk and thought no more of it until, a few weeks later, I picked it up to pour some salt on my fries and realized it was nearly half empty. “Wow,” I thought, “I guess I really do like salt.” I was touched then, truly grateful my boss had taken the time to notice such a seemingly small habit. But my next thought was frightening: should I be eating so much salt? Probably not. But did I try to cut back? No, I liked to be able to see the snow on my food. In the twelve years since my cholesterol numbers have always been idea and my blood pressure only increases when I’m having a fibromyalgia flare. Yes, now and then I’ve felt I probably should cut back on my salt intake, despite those “good” numbers, but it’s such a hard habit to break! 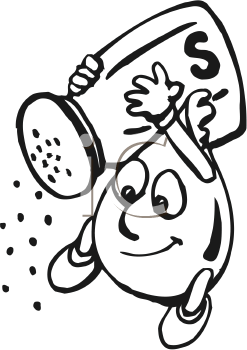 Because of the USDA’s and the CDC’s counsel, the average person takes in too little sodium to flush out the necessary amount of renin, (stored by our kidneys), which increases our risk of heart disease. Huh……Of course the article ends with an editor’s note to talk to your doctor before either increasing or decreasing your salt intake, (which we should do when considering any change in diet), but because of all the evidence – or lack thereof in this case – I believe I’ll stop worrying about whether or not I should cut back on the salt. After all, it’s proven that worry in itself can increase our blood pressure, so I’m already taking a positive step, right? The man who gave me the salt shaker has moved on to another company, but I still keep the salt on my desk, and think of him every time I pour it on my lunch. I encourage you to read Mr. Taube’s article in full (its short) and tell us what you think. Will you too stop worrying so much about your salt intake? Click here to subscribe to This Side….Over Yonder.